Did you know that using data in your marketing strategy can be a game changer? Both of these techniques require data…and LOTS of it. If you want to learn how to use data to stay competitive and capitalize on these same opportunities, read on to learn exactly how. Welcome back to our article series on how to leverage the power of data-driven marketing to improve your customer’s experience, increase sales and boost overall market growth. In Part 1, we discussed what data-driven marketing is, its benefits and obstacles and how it can increase your bottom line. In Part 2 below, we outline a step-by-step process model to get you thinking like a data-driven marketer and taking the first steps toward launching some ROI-driven campaigns. Ever heard the old adage, “Your gut never lies”? That may be true when you buy a plant or choose an ice cream flavor, but it doesn’t always hold true with marketing. You know what doesn’t lie? DATA. Data gives you the cold hard facts about your customers’ preferences and buying behaviors. Using data in your marketing prevents you from relying on guesswork and hunches that provide no guarantee. 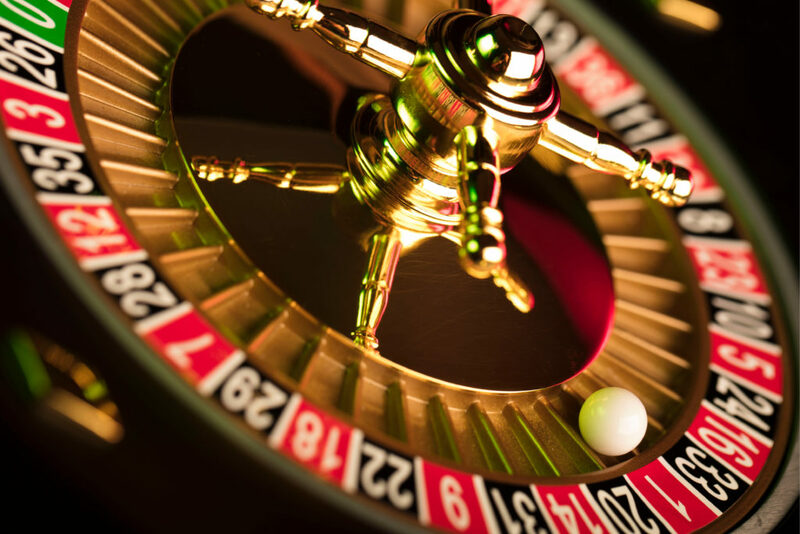 Deciding on tactics as you go (without any data) is kind of like playing roulette with your marketing. This “throw everything against the wall and see what sticks” approach seldom works—and it also leads to burnout. Stick to the data and your marketing will be much more deliberate and laser-focused. NOTE: As you launch your data-driven marketing campaigns, you may find the need to use your gut some of the time. It’s okay to rely on intuition only if it is based on information you gleaned from data. The first step to building a strong foundation for your data-driven marketing strategy is to define your goals/KPIs (key performance indicators). What are the overall goals for your marketing campaigns? One of your goals is to increase website lead conversions. Your website gets 10,000 visitors a month and your current lead conversion rate is 5.0% (500 people opt in). Your KPI is to get 750 leads per month or convert 7.5% of your traffic and reach that figure in six months. You can also break this down into monthly conversion goals. It can be tempting to tackle multiple goals simultaneously and go a little crazy. However, this can be disastrous. Here’s why: If you optimize too many goals, you will not only be overwhelmed, but you also may not be able to isolate your goal enough to impact significant change. As an example, let’s say you are trying to improve product sales conversion rates on your site, but you are also noticing that more people are abandoning your cart, so you try to lower cart abandonment, but then your revenue per order tanks. Instead of running after problems and spinning your wheels, focus on one or two tactics first, get them in motion and solidified before you move on to tackle more. If you are starting new plans with no data to use as a jumping off point, establish benchmarks first. So if you want to get some leads from your new website, track conversion rates for at least one to three months and use this number as your baseline. Step 2: What Data Should I Collect? Collecting data is one of the most important steps of data-driven marketing campaigns. Because collecting the wrong data can leave you with a whirlwind of information and no direction on what to do with it. The data you collect should be driven by your goals. Review your goals and then work backward, determining what information would help you meet your objectives and evaluate progress. You can monitor most website behavior using Google analytics and site tracking code. Google offers UTM parameters to add to links to track different keywords and campaigns. For example, let’s say you wanted to track how many people clicked a link in your email and ended up purchasing your product through that link. Track this with UTM parameters and conversion goals in Google Analytics. Learn more about Google UTM parameters here. If you run an Ecommerce store, think beyond just sales conversions. Where are customers getting stuck? Analyze where customers may be getting stuck on their path to purchase and establish conversions along the journey. When collecting data and thinking about tactics, consider the WHAT and the WHY. WHY – Prospect A downloaded it because he came from a custom landing page; Prospect B downloaded it because she came from a retargeting Facebook ad; Prospect C downloaded it after seeing a special offer email. Example Takeaway: Make sure you are collecting data from each touch point. As you connect data with your goals, take yourself through the WHAT and the WHY of each goal. The key is to make your decisions on strategy as simple as possible and get a closer view of your customers’ behaviors to understand them better so you can feed this data into your marketing strategy. We will discuss data-driven strategies in later articles in this series. Collecting direct feedback data (surveys and pop-ups) is valuable, but not if it is frustrating your customers. The purpose of data is to improve your customers’ experience, not disrupt it. When collecting data, prioritize your customers and don’t encroach upon their privacy. One way to circumvent customer dissatisfaction is to give something back when you ask for information. In the case of surveys, offer participants a reward or incentive. The accounting service DeepSky devised a smart solution for gathering personal information from customers. The company offers a cost estimator that allows prospects to assess their monthly accounting budgets. Gathers relevant customer information without turning away customers (you are giving them something valuable in return). This incentive is much more valuable than a free eBook or whitepaper because it is personalized. Visitors are getting a unique website experience which translates to greater affiliation for a brand. It gives prospects a better idea of your products and services without jamming them down their throat. People’s behavior, trends, technology and customer interests can change rapidly. Keep an eye on the data and update it regularly. Don’t take “negative data” personally, reject it or be alarmed by it. All data is valuable because it gives you insight into what your customers want and how they behave–whether or not it lines up with what you thought. NOTE: Data collection can get quite tedious and complex depending on how granular you get, especially if you are using it to predict user behavior and get a full 360-degree view of your customer. This type of analysis may require sophisticated software like a data management platform and the help of professional data analysts which is outside the scope of this article series. Once you have some data that uncovers your customers’ attributes, it’s time to create or improve your buyer personas. Buyer personas are representations of your ideal target customer. They include basic demographic information (gender, income, education, etc.) as well as interests, pain points and potential product objections. Marketers use these buyer personas to influence decision-making and establish direction around marketing objectives. If you just started a new business, you may have created fake personas to devise a target audience. If your personas are fake, they are not based on real data. This is fine if you are just starting out and have no data to work with. But, if you have been in business for some time, data can help you focus more and hone in on your ideal customer. As your business grows, use your data to fill in the gaps to improve your personas or create new ones. Never heard of buyer personas or need more information on how to create them? Start here. Your data will also give you a more complete picture of your customers. Maybe you already have customer data segmented by income or age. This is a good start but not every 40-year-old female living in Chicago will behave the same. And targeting this group with the same messaging will not resonate with them. Now what if you knew that a specific segment of this audience was single and liked to search Google for weekend vacations that were not too expensive but lavish enough that they felt like a getaway. If you are a travel brand trying to generate interest, BAM! things just got a lot more interesting. Relevancy creates meaningful customer experiences that make lasting impressions. Your customers are individuals, not templates, and each will interact with you uniquely. The more data you can gather from individual customers the more relevant your messaging and targeting will be. Now here’s where it gets exciting. It’s time to devise some plans to target your audience with the right information at the right time. In a future article in this series, we will discuss specific data-driven marketing strategies. Today, we will provide an overview of what factors to consider when devising these plans. 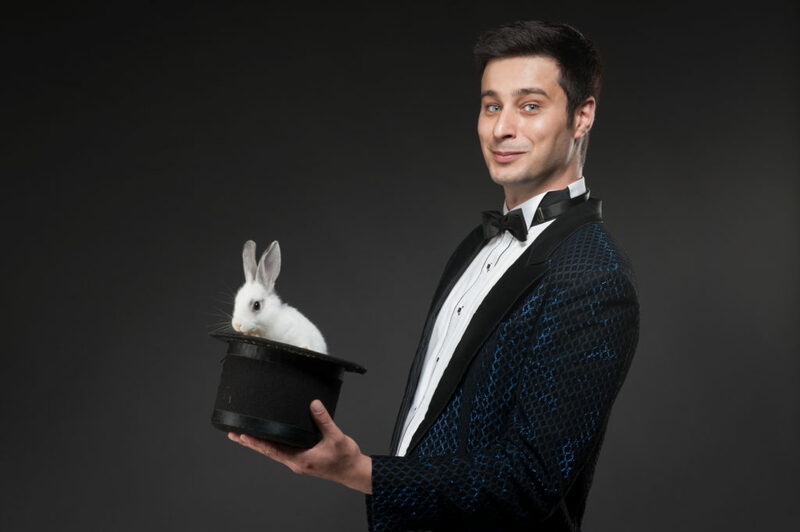 One key to executing successful data-driven marketing strategies is to be like a magician, or at least make your customers think you are. AMAZE them with your personal offers. DAZZLE them with your knowledge of what they love. ASTOUND them with how well you know what they need at exactly the right time in the exact place they are looking for it. Use the data you collected along with your buyer personas to target your prospects with personalized information. In Part 1, we discussed an example of how Amazon does this so brilliantly. 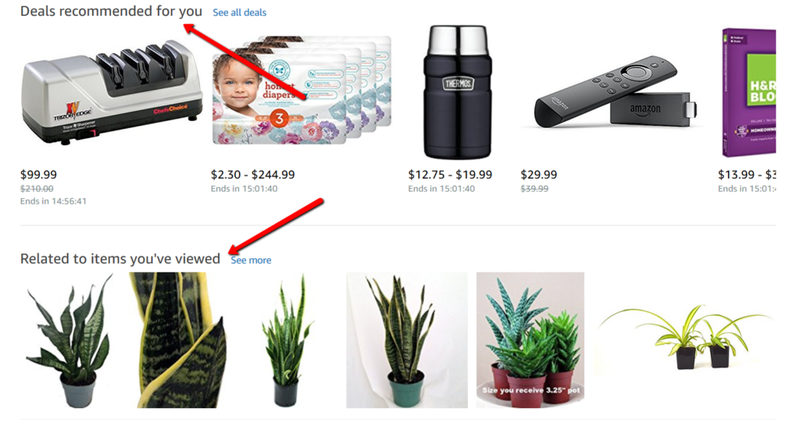 Amazon showers its homepage with personal recommendations based on the user’s buying history, search history and personal preferences. GOOD TO KNOW: You will notice that personalization is a key point we are weaving into most data-driven marketing strategies. Any time you can improve the customer experience with more personalized, relevant results, you will notice an uptick in conversions. We will talk more about personalized marketing strategies in Part 3 of this series. When creating data-driven marketing strategies, consider the buyer’s journey. Your personas will move through their own journey, starting with awareness of your brand and realizing they face a challenge, and finishing with a decision to purchase your product. Tailor your data-driven strategies to where your prospects are in this journey. At the Awareness stage, potential buyers may not be aware of your brand or that they have a need for your products. Focus your awareness stage content on uncovering their pain points without discussing your products and brand just yet (it’s not time to sell). Typical awareness-stage content includes educational content such as blogs, infographics and other educational material. Calls to action can include content that educates and builds trust. TIP: Track content downloads and gather prospect information to enhance your customer profiles. Once prospects realize they have a need, they will start researching answers. During the Consideration stage, provide prospects with more in-depth content such as whitepapers, case studies and industry reports. Or maybe launch an informative email series. The goal is to continue to build trust and bring awareness to your company as a potential solution to their problems. TIP: It’s still not time to deliver a heavy sales pitch. Don’t worry, the time will come. 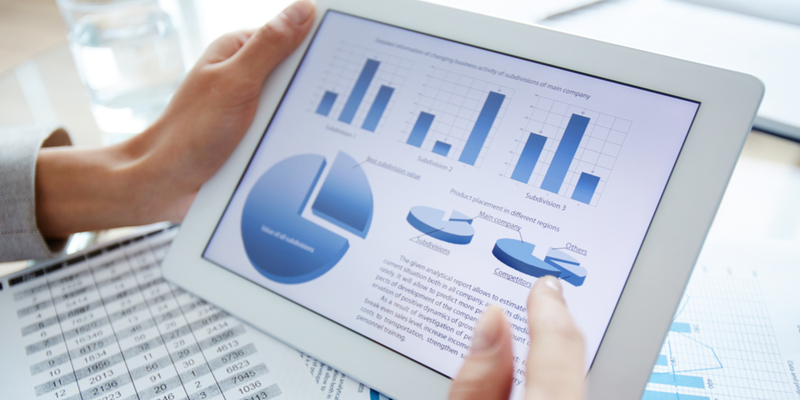 Continue to collect data to keep track of your prospects’ interests. When buyers reach this stage, they are ready to pull the trigger on purchasing but they are still deciding which solution or product is best. Your customer data will be key here. Use it to match your content to their specific needs. The most impactful content will include case studies and testimonials from real customers who have used your product. Use webinars to educate and also demonstrate the benefits of your products and publish special discounts and incentives to entice would-be buyers. As you progress, extract new insights from your campaign results and use it to optimize and improve your testing, continuing to adapt along the way. Ask more questions from your data so you can get more actionable insights. Depending on the size of your campaigns, you may also want to run a pilot (test) campaign to see how it performs. Once you get positive results, throw more of your marketing budget into it. Basic tracking does not require expensive software. Use Google Analytics and the built-in analytics from your social platforms as a start. As you grow, dive deeper into Google Analytics and adopt more sophisticated software so you can gain more detailed insights from your data. Ready for some data-driven marketing strategies? We just discussed a step-by-step process model for launching a data-driven marketing campaign. Review this process and start identifying some goals and collecting data to create new marketing strategies. In the next article in this series, we will introduce several data-driven marketing strategies that are proven to get results. We will see you there!